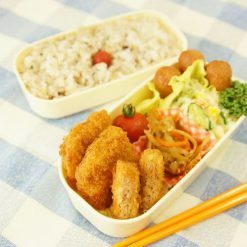 A rich and flavorful Burdock Root Soy Cutlet made from soy ham with added vegetables. A rich and flavorful soy meat with vegetables and soy ham prepared throughout original technique with soybean protein. Because it is made from soybeans, without any meat or fish, aside from its health benefits, you can also take in plenty of protein, as well as soy isoflavine and soy lecithin which is said to be good for your skin and health! 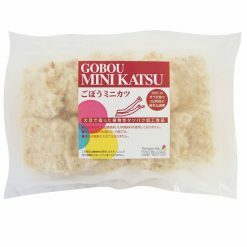 Burdock root soy cutlet is full of dietary fibers, helping you clear your digestive system and rid your body of toxins. No artificial coloring, artificial preservatives, additives, or geneticially modified crops used in the making of these products. Fry frozen soy cutlet at 180℃ for 3 – 4 minutes.